During the Internetdagarna 08 conference in Stockholm today, the World Internet Institute released their new report on Swedes and their usage of internet. 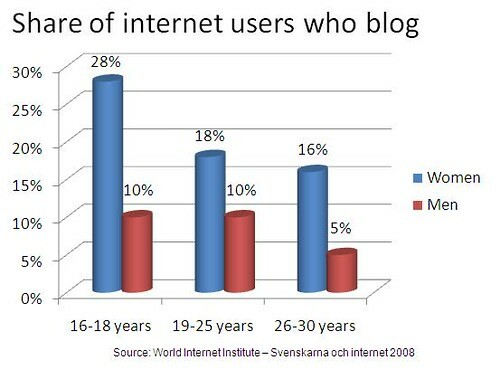 It seems that the survey confirms the findings from my BlogSweden 3 survey earlier this year, that young women are now dominating the Swedish blogosphere. Among 16-18 year-olds it is almost three times as common for girls to blog than it is for boys and in the 26-30 year age group it is even more than three times as common for women to blog. I will update with more information once I get the entire report. Tags: sweden, wii, bloggar, tjejer. Ping.